Welcome to Willow Wednesdays! Featuring art by Willow, the cover artist for the Monkey Queen series, with her kind permission! Read on after the cut for a special, do not miss installment! First, the bad news. In case you missed the post from last week, Willow has been diagnosed with tendinitis in the wrist of her right hand…her drawing hand. As she put it on Facebook, it “hurts like Hell” when she tries to draw. She’s under doctor’s orders to refrain from drawing until further notice. This means that several projects Willow was working on have been curtailed until she’s fully recovered, including the Yokai art book she was hoping to publish for a show in July…and the cover to the next Monkey Queen book, The Crown Of Kylthena. The good news? 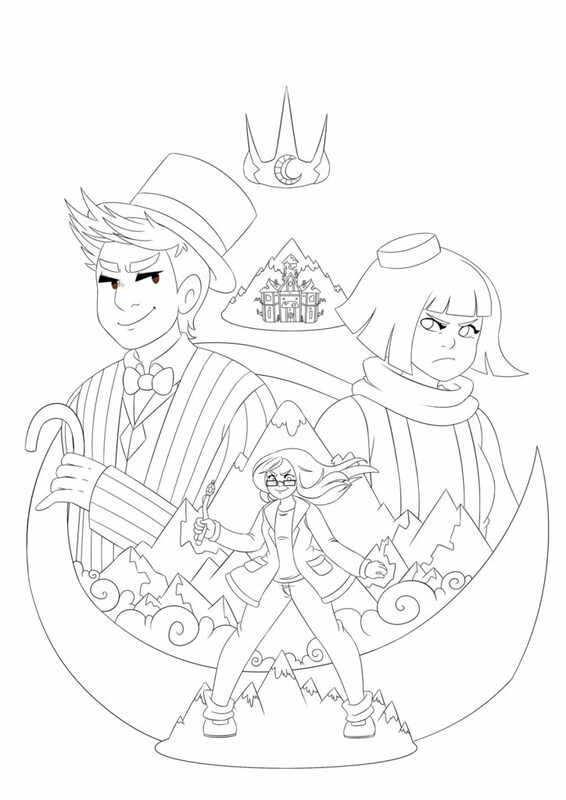 The cover is mostly done; all Willow needs to do is add a few touches to the line art, and do the coloring. Once she’s recovered, it won’t be a long wait. By then, the book should be finished, and it’ll be released soon after that. I do hate to make everyone wait, though; you’ve all been patient and kind about all the delays, and I thank you for that. And this is post #400 on this blog, so I wanted to make it special…and Willow gave the go-ahead. So, to celebrate the 400th post, here’s a preview of The Crown Of Kylthena! First, here’s Willow’s first sketch of a character being introduced in the book: Alasdair Sterling, wizard, gadgeteer, thief (now reformed…or is he? 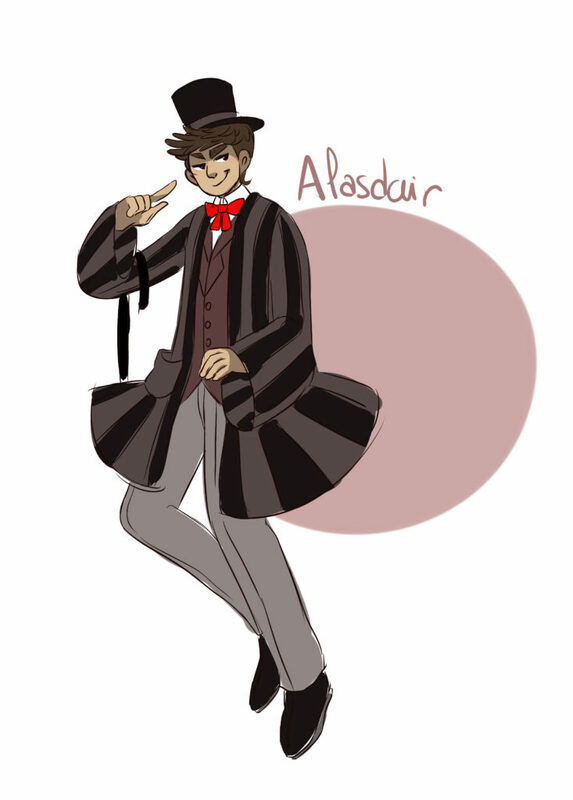 ), dapper wit and lover of a good cup of tea. Here’s Willow’s almost-completed line art for the cover! And here’s a preview of the book. Alasdair and Michiko are meeting for the first time since the incident in Faerie’s courts. (It wasn’t Alasdair who insulted the Countess…but it wasn’t Michiko who tried to steal the Court seal.) It’s not going smoothly. Michiko picked up her staff and set one end against the ground, grasping the other end in both hands. As Alasdair watched, the staff grew, carrying its bearer with it. She rose past the barrier and jumped off the staff, landing behind Alasdair. He turned just as the shrinking staff swooped over his head and into Michiko’s hand. “You don’t give up easily, do you?” Alasdair said, raising an eyebrow. “Were you there when that wyrdra thief was killed?” Michiko said. “There’s a first time for everything. Are you going to talk?” Michiko took a step towards Alasdair. “You’re bluffing.” The Monkey Queen took another step. “What is it with you and tea?” Michiko raised an eyebrow as she moved closer. There was a flash of light. A spellbolt shot from the sphere, hitting Michiko before she could react. She dropped her staff and fell to her knees, shaking her head.